I liked it. It was by no means perfect, but it met the my expectations that had been set by the trailer and clip I'd seen. If you aren't a fan of absurdity, you will probably want to skip this one. The whole thing seemed intended as an allegory for the artistic process. When an artist completes her work, she kills it, because it's no longer growing or changing. Just because it's dead though, doesn't mean that it has no lasting affect on those it touched (or touches), including the artist. But, more importantly, it was funny. I was thinking about seeing this with a friend who might like it too, but she's been a bit funky lately and grumbling about feeling like a failed artist. Does the movie lean hard on the failed artist aspect? I don't want to see something that's just going to make her more depressed! I'd say it focuses on a specific type of artistic failure, the inability to finish a project. That's one I'm all to familiar with, but I still enjoyed it. Yes, it's quite funny and won't make anyone depressed. In some way it's an appartment-sized, but much less angsty version of Synecdoche, New York (which also features an artist unable to finish his labyrinthic creation and gets lost in it). 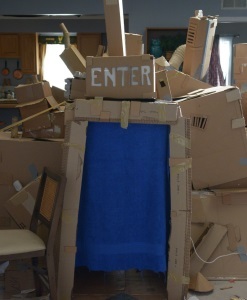 It's short and inventive, and the cardboard/origami props are fantastic. It reminded me of early Terry Gilliam (Time Bandits for the minotaur scene for instance) or Michel Gondry (The Science of Sleep, also about a creator and featuring lots of animated cardboard props, and Mood indigo). I hadn't heard of this one until this thread, so thanks! Totally my kind of thing. I mean, I may be an artist who never completes things out of a fear of failure, so I get Dave. And I dig dungeons and adventures and stuff, I'm pretty much this movie's perfect audience. And yeah, I loved it. LOL'ed a few times throughout, often at the effects. Saw this last night and enjoyed it. Some of the allegory / metaphor was pretty heavy handed but the whimsical set design was really delightful. Would never have heard about it without this thread, so thanks for that!